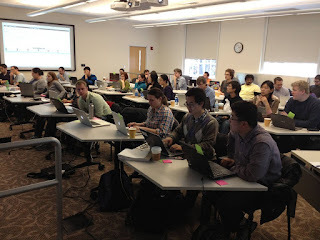 A couple of weeks ago I, with the help of others here at UVA, organized a Software Carpentry bootcamp, instructed by Steve Crouch, Carlos Anderson, and Ben Morris. The day before the course started, Charlottesville was racked by nearly a foot of snow, widespread power outages, and many cancelled incoming flights. Luckily our instructors arrived just in time, and power was (mostly) restored shortly before the boot camp started. Despite the conditions, the course was very well-attended. 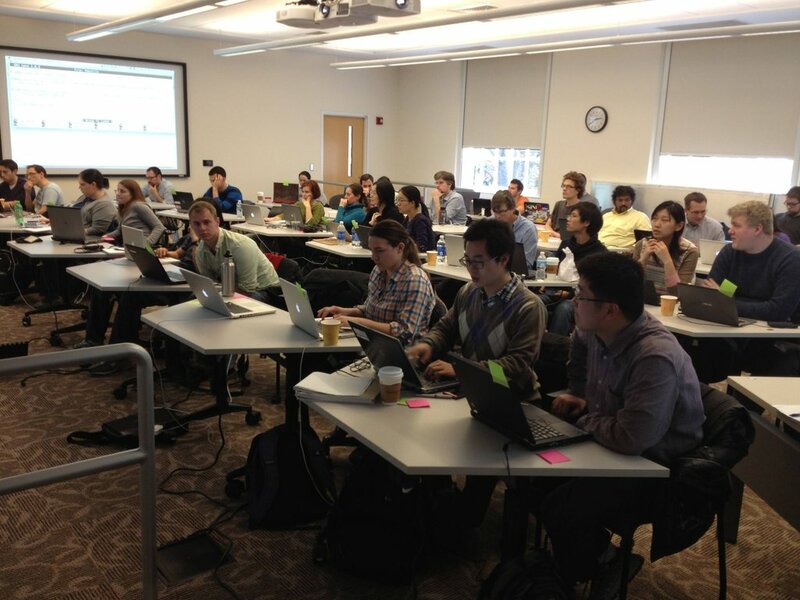 Software Carpentry's aim is to teach researchers (usually graduate students) basic computing concepts and skills so that they can get more done in less time, and with less pain. They're a volunteer organization funded by Mozilla and the Sloan foundation, and led this two-day bootcamp completely free of charge to us. The course started out with a head-first dive into Unix and Bash scripting, followed by a tutorial on automation with Make, concluding the first day with an introduction to Python. The second day covered version control with git, Python code testing, and wrapped up with an introduction to databases and SQL. At the conclusion of the course, participants offered near-universal positive feedback, with the git and Make tutorials being exceptionally popular. Software Carpentry's approach to teaching these topics is unlike many others that I've seen. Rather than lecturing on for hours, the instructors inject very short (~5 minute) partnered exercises between every ~15 minutes of instruction in 1.5 hour sessions. With two full days of intensive instruction and your computer in front of you, it's all too easy to get distracted by an email, get lost in your everyday responsibilities, and zone out for the rest of the session. The exercises keep participants paying attention and accountable to their partner. Perhaps more relevant to a broader audience are the online lectures and materials available on the Software Carpentry Website, which include all the above topics, as well as many others. We capped the course at 50, and had 95 register within a day of opening registration, so we'll likely do this again in the future. I sit in countless meetings where faculty lament how nearly all basic science researchers enter grad school or their postdoc woefully unprepared for this brave new world of data-rich high-throughput science. Self-paced online learning works well for some, but if you're in a department or other organization that could benefit from a free, on-site, intensive introduction to the topics listed above, I highly recommend contacting Software Carpentry and organizing your own bootcamp. Finally, when organizing an optional section of the course, we let participants vote whether they preferred learning number crunching with NumPy, or SQL/databases; SQL won by a small margin. However, Katherine Holcomb in UVACSE has graciously volunteered to teach a two-hour introduction to NumPy this week, regardless of whether you participated in the boot camp (although some basic Python knowledge is recommended). This (free) short course is this Thursday, March 21, 2-4pm, in the same place as the bootcamp (Brown Library Classroom in Clark Hall). Sign up here.